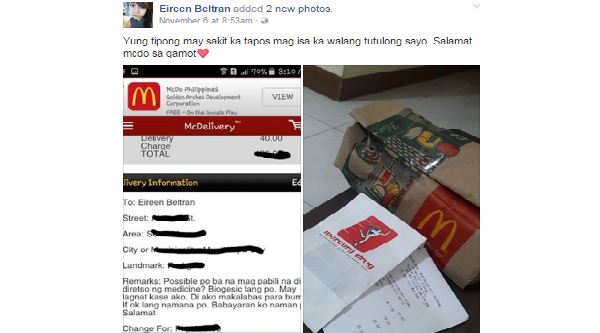 Eireen Beltran, posted a photo of her order from Mcdonald’s delivery together with the medicine bought from Mercury Drug by the Mcdonald’s delivery crew last November 5, 2016. Her post became viral and netizens positive feedback was unending towards the restaurant. The people investigated that the good hearted branch was located in Muntinlupa City. The service that the Mcdonald’s crew revealed is what we call a real Extra Mile. Hopefully we can see and experience more good hearted deeds like these.